[S1250] Coming to America: The Melton/Milton's [ http://familytreemaker.genealogy.com/users/l/e/i/Vera-M-Leisure/index.html ], Vera Michael Leisure, 54 [http://familytreemaker.genealogy.com/users/l/e/i/Vera-M-Leisure/BOOK-0001/0003-0051.html#IND1363REF82]. Ansel Melton was born Abt. 1775 in Raleigh, Moore Co., N.C., and died August 07, 1843 in Cannon Co., TN // Buried Old Melton Cem, Sugar Tree Knob, Tn. He married Mary Huffman 1790 in Moore Co., N.C., daughter of John Huffman. She was born January 1766 in PA, and died 1859 in Cannon Co., TN // Buried Old Melton Cem, Sugar Tree Knob, Tn. Information gathered from: Cannon County Cousins Shirleys and Melton's; by: Anne Shirley Bumpus 1986. Ancil Melton served in the American Revolution. Ancil Melton bought a 300 acre tract of Land and Orange County, North Carolina, on 29 January 1799. In 1800 he was listed on the Orange County tax list as having 300 acres and one poll. There are no surviving Orange County tax lists for the years 1801 through 1816. He sold this tract of Land situated on the waters of Dry Creek and a little Almance on 11 December 1806. The following year Ancil and Mary Huffman Melton appeared in Warren (later Cannon) County, Tennessee. According to the History of Woodberry and Cannon County, Tennessee, Ancil Melton, his wife, Mary Huffman Melton, and their seven year old son, John, were among the first group of settlers to arrive in 1807. It appears that the Ancil Melton who resided in Orange County sold all his property there and moved his family to Tennessee. He was not enumerated on the 1820 Census in Orange County. Also living in Orange County in 1800 were John and Daniel Huffman. The Ancil Melton who migrated to Tennessee was born between 1770 and 1780 according to Census records for 1820, 1830 in 1840. He had four sons William, James, Jacob and John -- born between 1790 in 1800. Researchers have found the following children for Ancil and Mary Huffman; John, Mary, Joel, Jesse and James. A Reminiscent History of the Ozark Region published in by Goodspeed Bros., Chicago, Illinois, 1894, lists one other son -- Austin. Ancil's Will names another son, William, and "the heirs of Elisha." Jacob is listed in among heirs in the Estate Settlement, making a total of nine children. Family traditions relates that Ancil and Mary Melton lived to be well over hundred years of age. 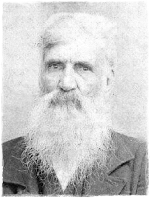 Ancil Melton's will was proven in court in August, 1843, and the estate of both Ancil and Mary Melton was settled in 1862, refuting such traditions. This Indenture made this twenty ninth day of January in the year of Our Lord one thousand seven hundred and ninety nine between George Clark of the one part and Ancil Melton of the other part being both of the County of Orange and state of North Carolina Witnesseth that the said George Clark for any consideration of the sum of sixty pounds to him in hand paid by the said Ancil Melton at or before the sealing and Delivering of these presents the receipt whereof the said George Clark doeth hereby and acknowledge hath Granted, bargained, sold aliened released and Confirmed and by these doth Grant bargain sell alien release and Confirm from him and his heirs unto the said Ancil Melton his heirs and assigns forever; all that seat Tract or Parcel of Land and premises situate lying and being in the aforesaid County of Orange on the waters of Dry Creek and the little Allamance; Beginning at a Poplar at a spring of said Creek Running thence south Seventeen Chairs to a Red Oak thence East Seventy Seven Chains to a Black Jack thence North five Chains to a Black Jack thence East twenty Chains to a Black Jack thence North ten Chains to a Black Jack thence East ten Chains to a Red Oak on a Hill side near a head branch of the little Allamance thence North Crossing the said creek thence up the meander thereof to the Beginning, Containing three hundred Acres of Land obtained from the State of North Carolina and Registered in the County of Orange for that purpose Reference thereunto being had will more fully appear... In witness where of the said George Clark hath unto set his hand and Seal the day and year first above Written. This Indenture made this Eleventh day of December in the year of our Lord one thousand Eight hundred and Six between Ancil Melton of the County of Orange in the state of North Carolina to the one part, and Daniel Johnston of the County & State aforesaid of the other part Witnesseth that the said Ancil Melton for and in Consideration of the sum of one hundred and Twenty Five pounds current money to him in as paid by the said Daniel Johnston at or before the sealing and delivering of these presents the right whereof the said Ancil Melton do is hereby and acknowledge hath Granted, bargained and sold... And by these presents do grant, bargain, sell... unto the said Daniel Johnston his heirs and assigns forever all that seat Tract or Parcel of Land and premises situate lying and being in the County of Orange on the waters of Dry Creek and the little Alamance beginning at a poplar at a spring of said Creek running thence South seventeen chains to a red oak, then East twenty seven chains to a black Jack, thence North five chains to a black Jack, then East twenty chains to a black Jack, thence North ten chains to a black Jack, thence East ten chains to a red oak on a hill side near a head branch of the little Alamance thence North and crossing said Creek forty eight chains to a red oak, thence West fifty chains to Dry Creek thence up the meander thereof to the beginning. Containing Three hundred and acres of Land obtained from the state of North Carolina and registered in the County of Orange for that purpose of reference being thereunto had will more fully appear and the reversion... in Witness whereof the said Ancil Melton hath hereunto Set his hand and Seal the day and year first above written. In the name of God Amen. I Ancil Melton being of sound and perfect mind and memory blessed be God do this second day of June in the year of our Lord One Thousand Eight hundred and forty two make and publish this my last will & Testament in manner following. That is to say (First) I give and bequeath unto my beloved wife, Mary, during her natural life all that tract or parcel of Land Whereon I now live and at her death or marriage the aforesaid land to be sold and Equally divided amongst all my children. And the Heirs of Elisha Melton to draw an Equal part and all other lands be-longing to my Estate at my death to be sold and Equally divided amongst all my children William Melton and James Melton Equal shares of the land to be sold and divided and all my Household and farming Utensils - Mare and Colt bridle and saddle two cows and calves sheep and hogs and beehives geese and five hundred and fifty dollars worth of notes. I give and bequeath to my beloved wife Mary Melton during her natural life or widowhood and also my blacksmith tools and let the Hand and all my children as their work as they have done heretofore. And all other stock to be sold at my death and Equally divided amongst all my children William Melton and James Melton to draw Equal Shares with the rest of the children. I do hereby give and bequeath to my son James Melton that tract of land which he holds my bond for And for the deeds to be made according to it -- I Ancil Melton Do hereby make and ordain my worthy friend John Melton Executor of this my Last Will and Testament. In witness whereof I the said Ancil Melton have to this my Last will and Testament Set my hand and seal the day and year above written. Signed Sealed published and declared By the said Ancil Melton The Testator as his last will and Testament in the presence of us who were present at the time of signing and sealing. There personally appeared in open court Luke Shirley and James P. Perry subscribing witnesses to the within paper writing purporting to be the Last will and Testament of Ancil Melton deceased. Who being first sworn depose and say that they were acquainted with said Testator in his life and that he acknowledged the same in their presence to be his Last Will and Testament on the day it bears date. A deed on conveyance from Ancil Melton to Stephen Cantrell for 30 acres of land lying in Cannon Co. (originally Warren Co.) bearing date the 15th day of August AD 1834 was this day produced in open court for probate and was duly acknowledged by Ancil Melton the bargainer and ordered to be certified for registration. John Melton this day produced in Open Court a paper writing purporting to be the Last Will and Testament of Ansil Melton decd. which paperwriting being duly proven by the oath of Luke Shirley and James P. Perry sub-scribing witnesses thereto.